Four goals in a blistering first 25 minutes all but secured the victory with Raheem Sterling, Aguero (twice) and Ilkay Gundogan all finding the net. Aguero completed his hat-trick from the penalty spot on 56 minutes before Sterling tapped in to round off the scoring. Worryingly for Chelsea, it could have been more. Aguero missed an easy chance in the first period while City dominated from start to finish. Chelsea manager Maurizio Sarri appeared so irked by his side’s performance that he stormed down the tunnel at the end of the game without shaking City manager Pep Guardiola’s hand. After a strong start to the season, Chelsea have struggled in recent weeks with Sarri publicly criticizing his players’ desire. 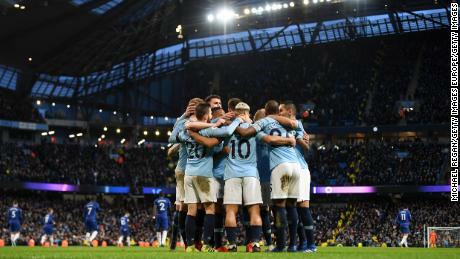 That is not something City players can be accused of as they have chased down Liverpool — who beat Bournemouth 3-0 Saturday — to go top of the league on goal difference. The Merseyside club still has a game in hand that could see it return to the top of the table but faces a difficult trip to Manchester United in its next fixture in two weeks time. Aguero’s hat-trick was his 11th in the Premier League since signing from Atletico Madrid in 2011, equaling the record set by former Newcastle, Blackburn and Southampton striker Alan Shearer. His first goal was a stunning strike, arrowed into the top corner from 25-yards out. A second followed soon after when he intercepted a poor back header from Chelsea Ross Barkley to turn and fire beyond Kepa Arrizabalaga. Speaking to UK broadcaster Sky Sports after the match, Guardiola identified Aguero’s “consistency” in front of goal as a key part of his side’s success. Meanwhile, Aguero himself spoke about how important it was to “continue the same way” as the title race progresses in the weeks ahead. Third placed Tottenham Hotspur ensured they stayed within touching distance of Liverpool and Man City thanks to a 3-1 home win over Leicester City earlier Sunday. Davinson Sanchez opened the scoring in the first period as he stooped home to head in Christian Eriksen’s perfectly-placed cross. Leicester spurned the chance to equalize in the second half as Hugo Lloris saved Jamie Vardy’s penalty after James Maddison was felled in the area. Eriksen doubled Spurs’ lead with a pinpoint strike from the edge of the area before Vardy did pull one back from close range. And despite some late Leicester pressure Son Heung Min broke away to round off the scoring in added time.